Most of the time we might feel more comfortable talking with strangers more openly about our most painful issues rather than with those who are supposedly our close allies. Imagine, just for a fair second, that you’re invited to an event you have no desire to be in. You are assigned to share the table with people you’ve never met before, yet next few hours they will turn into the most admirable people you ever meet. Now answer me, how does that perspective sound to you? I knew it! Isn’ t it charming? A new comedy from Fox Searchlight, “Table 19” directed by Jeffrey Blitz starring Anna Kendrick is the right place for you to be, maybe not at the table numbered as 19, but nearby to be able to observe everything first-hand. While it was an awkward situation for everyone to deal with during the wedding, we find many interesting facts about each guest, who, in the end, were not as weird as they appeared in the beginning. Each invitee had their own story to share about the bride’s family. Walter, an ex-con also got invited, but how did it happen you will continue scratching your head even after the movie ends. However, you will be glad having him as an attendee, because his expressive face was hilarious enough to have yourself entertained throughout the movie. Eloise, however, who is an ex-maid of honor reveals that she was released off her duties after her unsuccessful relationship with Teddy, a man who seems to still have feelings for her. As the story unfolds, we also learn about Nanny Jo, a married couple Jerry and Bina, a young man, Rezno, who hopes to find someone for himself at the wedding. But the most quirky and sweet about this is how the strangers get connected so quickly. They understand each other, support each other when the wedding cake got ruined, and even offered a shoulder when you need to rest your neck while you share the story of your life. But that is the least you as a viewer can prepare yourself, because Table 19 has much more to offer than you could initially expect. In conclusion, Table 19 is a pleasantly moving and charming movie about wedding party. It is romantic, funny and easygoing movie to watch. Anna Kendrick continues to surprise with her performance, reassuring the viewer once again that she alone can lead any movie without any support. Yet, the movie might not appear too funny for you, but it has a right amount of laughter, not too much and has hilarious lines to laugh at. 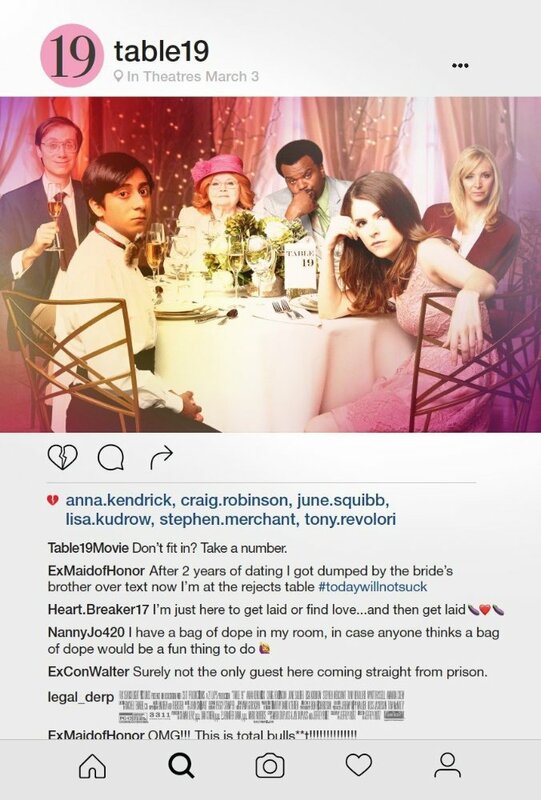 In the end, Table 19 is a worthwhile movie to watch by all means. So as soon as you hear that it’s been screened near you, go and check it out as a good remedy to release the daily life’s stress.